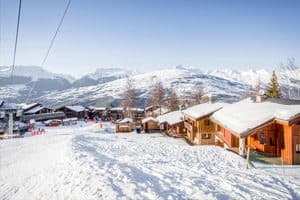 Chalet Les Arolles is our most conveniently located ski chalet; situated on the edge of a blue piste and just 30m ski down to a modern 6-man chairlift; Les Arolles is truly ski-in/ski-out. 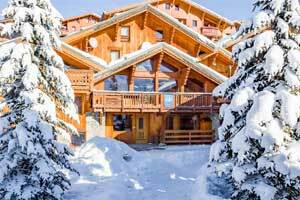 The ski chalet is spacious yet friendly and sleeps 14/16 in five ensuite bedrooms. There are two family rooms, each sleeping 4/5 and three twin bedrooms – some of which can accommodate an extra bed. All rooms are ensuite with a shower, basin and WC. 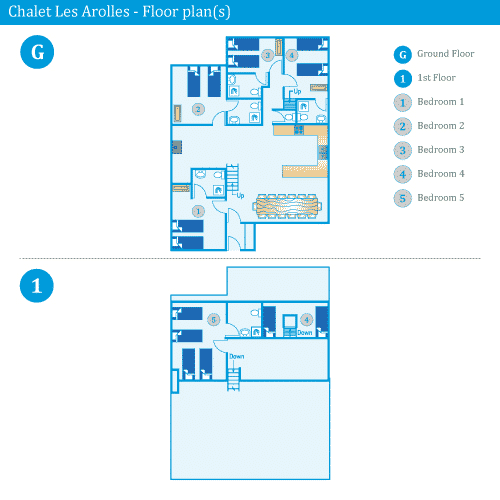 Les Arolles has a large open plan dining/living/kitchen area with a south-facing terrace. 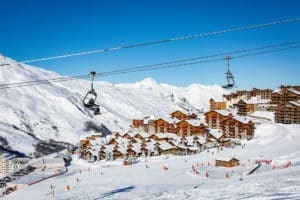 Large windows to the front allow you to sit at the dining table and enjoy the view out onto the piste, you can literally watch fellow skiers pass you by! 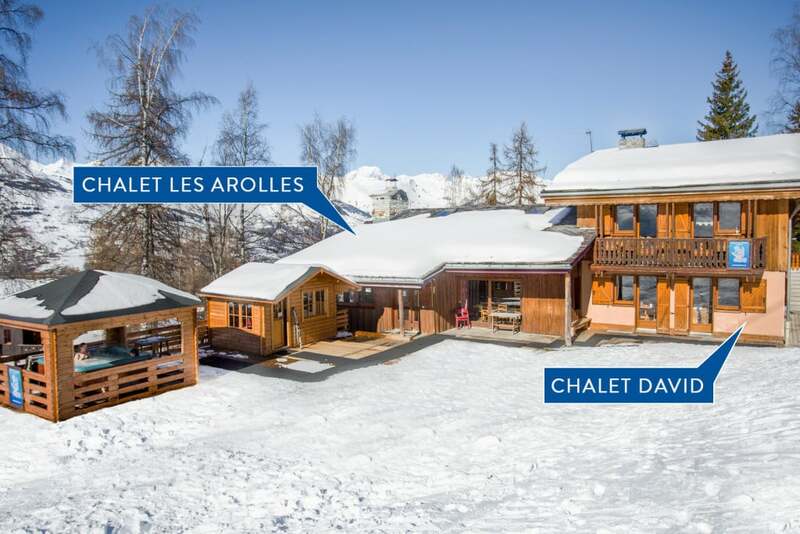 The hot tub is even closer to the piste, on the decked area, and is for the use of guests both in Chalet Les Arolles and Chalet David. 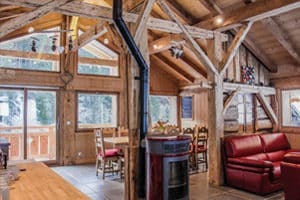 Breakfast in Chalet Les Arolles is served by your cook or host including hot dishes – porridge, bacon, eggs, pancakes as well as fresh bread fruit juice and coffee from Family Ski’s breakfast menu. 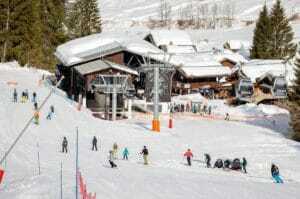 Lunch for all children in all our childcare clubs is served in Chalet Les Arolles. 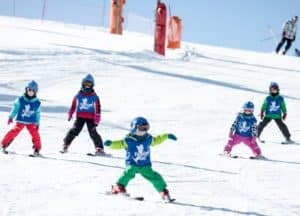 Our self-contained childcare den is just 10m from Chalet Les Arolles. 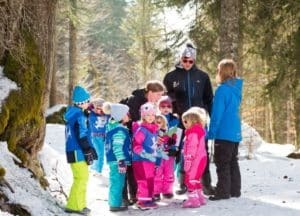 The decked area outside the chalet is the perfect place for safe daytime play and it is also the ski school meeting point for those children in our childcare clubs, we take them for you! Room 1 is a twin with ensuite shower and can take and extra bed for a family of 3 or be combined with another twin room on the same floor for a family of 4 or 5. Room 2 is a twin with ensuite shower and can take and extra bed for a family of 3 or be combined with another twin room on the same floor for a family of 4 or 5. Room 3 is a twin with ensuite shower which can be combined with another twin room on the same floor for a family of 4 or 5. Family room 4 has a twin parents’ room with ensuite shower. Stairs within the room lead up to a mezzanine sleeping area suitable for three children old enough to cope with the stairs. 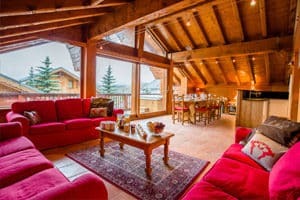 Family room 5 is a spacious open plan room with 4 single beds for a family of 3 or 4 with an ensuite shower room.